Disney fans are always looking for the most Disney inspired thing they can find, even when it comes to their homes. And if that’s the case, this home may just be the fairest of them all. 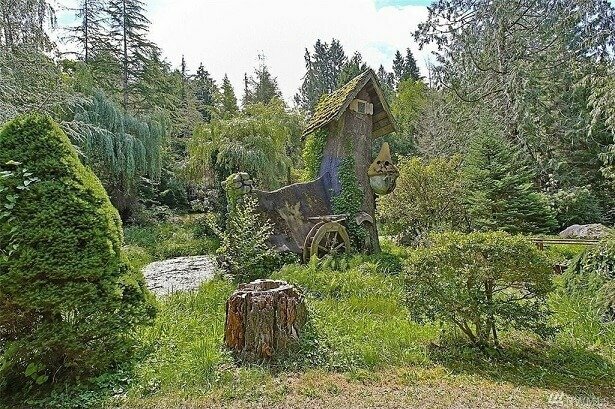 A cottage in Olalla, Washington inspired by Disney’s classic animated feature “Snow White and the Seven Dwarfs” remains on the market. In 2016 we first reported, this cottage was for sale for $825,000. Its price has changed over the past few years and now, it is available for $875,000. Undoubtedly the modest 6% price increase reflects the owner’s belief the market value has risen during the past 2 years. 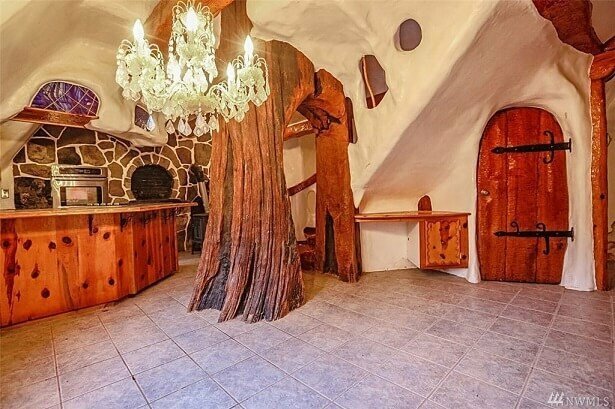 The price is nothing to sneeze at (even for Sneezy) but it is understandable when you consider that this 2,800 square foot 4 bedroom, 5 bathroom home comes with a walk through indoor tree trunk, a wooden bridge, and a tree house in the garden that has a small room with its own fireplace. In total the home has 5 fireplaces providing all of the cozy comfort you could ever want. 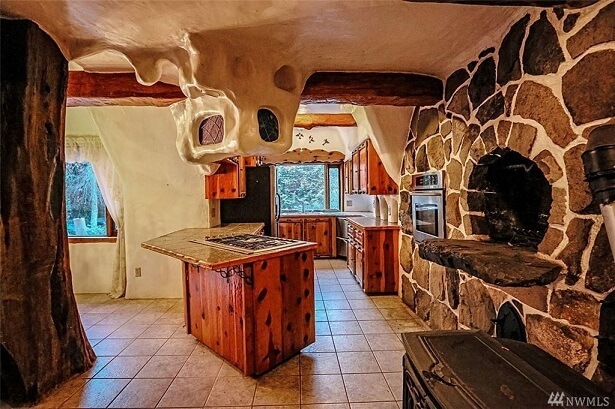 The kitchen nicely incorporates modern appliances into Snow White’s Cottage. This impressive cottage also features extreme high pitched and deeply sloped roofs making it feel like it came right out of the movie. It also sits alone on 5 acres of land at the end of a dead-end street, past a gated entrance. Unfortunately, the home still does not come with helpful woodland creatures to assist you with your chores. This has to be among the most impressive Disney inspired homes you will find. This handbuilt home has no square corners. Doors have extensive ironwork, there are hand-carved wood beams plus stained glass windows everywhere. 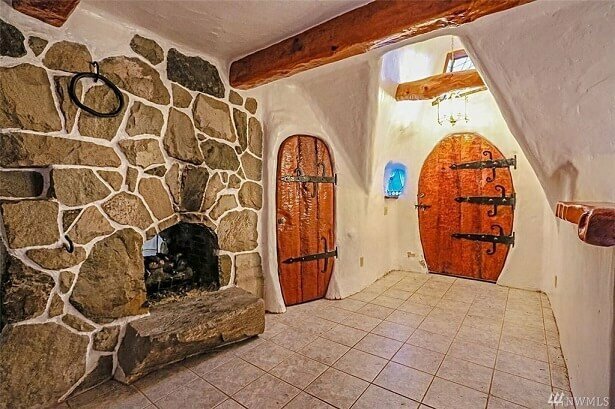 For more information on the listing for this Snow White-inspired cottage, visit John L. Scott Real Estate. 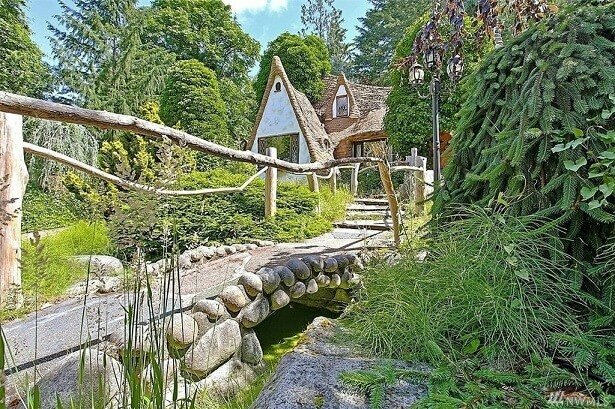 Would you consider purchasing this unique Snow White inspired Cottage? Let us know in the comments.